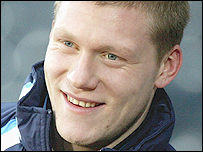 Birmingham City have signed Scotland international striker Garry O'Connor from Russian side Lokomotiv Moscow. Blues, who were promoted to the Premier League in April, will pay £2.7m for the former Hibernian player. The 25-year-old has signed a three-year contract at St Andrew's with the option of another two years. O'Connor had struggled to settle in Moscow for family reasons but signed off with the winning goal in the Russian Cup final in May. "Lokomotiv FC wishes to thank the striker for his high professionalism, hard work on the field and for the goal in the Russian Cup final," the club statement continued. O'Connor also thanked the Moscow fans for their support and added: "I hope you understand the reason why I am leaving. "There is only one chance in life to play in the English Premier league - the best league in the world. It's a great opportunity for me, which I would like to use." O'Connor's agent, Rudi Vata, told BBC Sport that the deal should be completed by Tuesday or Wednesday. Birmingham had an offer of £1m for O'Connor rejected in January and a further bid of £2m was also recently rejected. Lokomotiv are believed to have wanted a one-off payment for the player. Fulham, Everton and Portsmouth had also been linked with O'Connor, who scored 58 goals in 166 appearances for Hibs before moving to Moscow in March 2006. He scored the only goal in Scotland's friendly victory over Austria - and was on target again in the recent 2-0 Euro 2008 qualifying win in the Faroe Islands. Birmingham boss Steve Bruce has been keen to bolster his attack ahead of the new season back in the Premier League. The club are back in the top flight after a one-season absence and Bruce wants to avoid the goalscoring problems his side suffered when they were relegated in 2005/2006. Birmingham scored only 28 league goals and had the least number of away goals - with a tally of nine - of all the Premier League sides from that campaign. Bruce has had a bid rejected for West Ham's out-of-favour forward, Marlon Harewood.